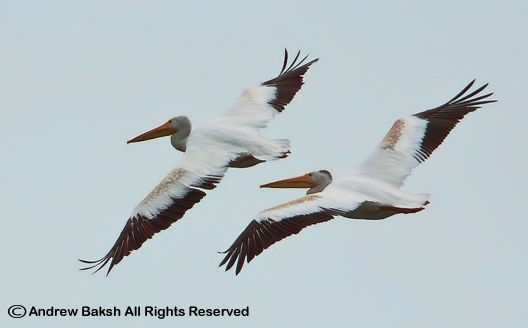 2 American White Pelicans (Pelecanus erythrorhynchos) in flight, seen from a boat at Jamaica Bay Queens New York. According to National Park Service Rangers, the birds have been around since last week and were seen on the bay side of the North End of the East Pond near the outflow valve. It was only until naturalist, Steve Walter's keen eye spotted the birds flying over the West Pond on Saturday, that the birding community were alerted to their presence. Yesterday, I searched unsuccessfully for them in the morning; then again in the late afternoon after reading a report that birder, Keith Michael, had seen them from the "A" train on the east side of the train tracks. I tried again today and was joined by Tom Burke and Gail Benson. After trying unsuccessfully from land we were able to access the bay by boat where we successfully located the birds on the beach side looking out towards JFK - this is about half way between Broad Channel and the Channel Bridge. The birds were enjoyed by Tom, Gail, Don Riepe and Cindy Goulder. If you try for these birds, first check the East Pond outflow on the bay side, if they are not there you may consider walking the shoreline going under the bridge to get to the beach on the other side overlooking the bay towards JFK Airport. Another option is to kayak or boat out to the area where the birds have been seen. Please take note of the tide table, so you do not encounter any difficulties returning. Another good bird that Tom, Gail and I had at Jamaica Bay Wildlife Refuge today was a Hudsonian Godwit, which was seen on the bayside of the North End of the East Pond. Wonderful photos of both the Pelicans and Godwit. I always enjoy sightings of the white pelicans. @Eileeninmd thanks visiting and for the nice comments. @Corey - check again, but it may come down to schlepping all the way down and crossing over to the other side under the bridge then working your way along the beach next to the train tracks and see if you could pick them up. Catching sight of American White Pelicans are always a thrill. I love the black tipped wings. 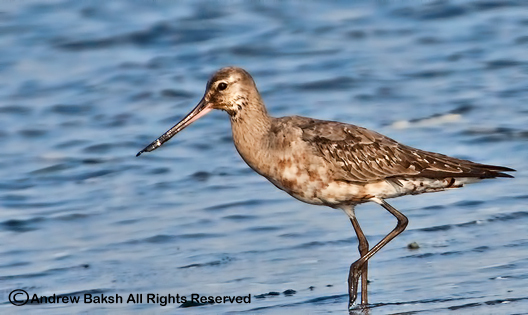 Such a pretty godwit. Terrific photographs, as always! So happy you got your Pelicans! You definitely worked hard for them. Great photo.